Nikko Bali Resort & Spa has completed the final phase in facility upgrades that started last decade, as part of the resort’s strategic repositioning. This is part of a multi-million dollar project that began in 2006 with the presentation of Wiwaha chapel, a cliff-top wedding venue. The split-level glass structure is completed in a contemporary design, and offers a sweeping 180-degree view of the Indian Ocean. 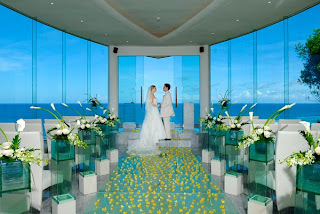 Wiwaha is now a top wedding venue choice in Bali. The Nikko Club, a contemporary lounge and dining space, was launched in August 2007. It incorporates a stylish outdoor swimming pool surrounded by a timber deck; a semi-open dining area bordered by half panes of frosted glass; and an indoor glass-enclosed fully air-conditioned lounge providing seamless ocean views. Guests of the 73 Club rooms can expect premium facilities and services, such as all-day a la carte dining and refreshments, complimentary Wi-Fi Internet, and mini library of best selling books. The Shore Restaurant & Bar was unveiled in October 2008. Patrons at this trendy dining venue enjoy scenic views of the Indian Ocean ; quality seafood, imported meats and a daily degustation menu, paired with an exclusive selection of fine and new world wines. Designed as a modern interpretation of a ship on stilts, The Shore has already received an award for its food and service in a leading Indonesian lifestyle magazine. In early 2009, guests were given access to Serenity Beach. The multi-purpose outdoor venue can accommodate up to 600 people for dinner receptions, banquets and large gatherings. It also has sun loungers and private cabanas where guests can sun-bath in privacy on the exclusive beach. Throughout the project, 385 rooms were refurbished and four different room types – Nikko Club, Nikko Family Room, Nikko Family Suite, and Seventh Heaven Room – were added. Nikko Family Rooms can comfortably accommodate two adults and two children under 12 years old, while Nikko Family Suites are more spacious and feature connecting rooms. All the en-suite bathrooms have safety features such as anti-slip padding in the bath tub, and mini steps. Junior guests in these rooms and suites can look forward to children’s toys, PlayStation 2 consoles, exclusive amenities, welcome bags and complimentary entrance to Nikko’s own Jungle Camp. The 14 Seventh Heaven rooms located on the seventh level were designed especially for a romantic retreat. Couples are pampered with a host of in-room amenities including a romantic dinner, special Mandara Spa treatments, floral bath, organic designer toiletries, daily complimentary chocolate pralines, signature gift set (exclusively designed traditional Thai wrap-around trousers, sarong wrap and aroma therapy kit), and privileged entry to the Nikko Club Lounge. Location, design and taste elements were revamped at the Japanese Benkay Restaurant. The restaurant now presents a contemporary design carried through a live Teppanyaki counter, sushi bar, Nabemono (yakiniku, shabu-shabu and sukiyaki) tables, and five private rooms. Guests at Benkay will be treated to authentic cuisine prepared with premium ingredients by Japanese Chef Masayasu Haruyama and his skilled culinary team. Indulgent treats abound at The Deli. Here, guests can delight in an array of daily freshly baked cakes and pastries, finest chocolate pralines, freshly brewed specialty coffee, herbal tea infusions, and fine wines. The facility upgrades were crowned with the December 16th launch of the resort’s new lobby, located at the former Khayangan lounge. It offers magnificent ocean views and features a spacious seating area for guests’ comfort as they receive personal and refined service. There is also a one-stop service area for reservations of local tours, activities, and dining. Visit the Mandara Spa corner where reservations for treatments at the Spa Villas can be made. 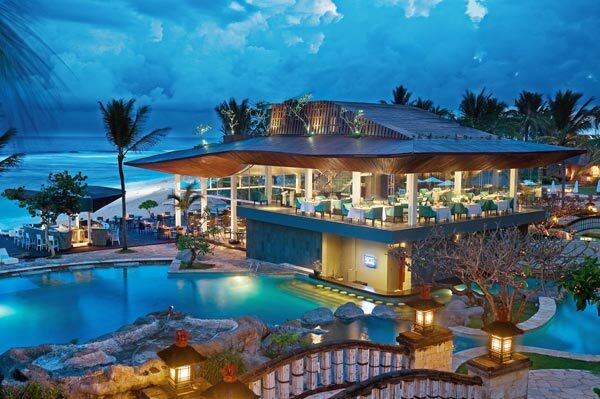 The Nikko Bali Resort & Spa is a 5-star resort hotel located atop a 40-meter cliff in Nusa Dua and offers a 180-degree view of the Indian Ocean. The 389-room resort, wholly owned by Indonesia’s PT Caterison Sukses, includes a Presidential Suite and three Royal Suites. 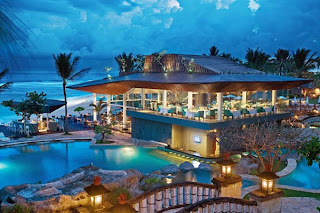 It caters to business and leisure The Nikko Bali Resort & Spa is a 5-star resort hotel located atop a 40-meter cliff in Nusa Dua and offers a 180-degree view of the Indian Ocean. The 389-room resort, wholly owned by Indonesia’s PT Caterison Sukses, includes a Presidential Suite and three Royal Suites. It caters to business and leisure Travelers, as well as families visiting the tropical Indonesian island of Bali. It is a 25-minute drive from Bali’s Ngurah Rai International Airport.